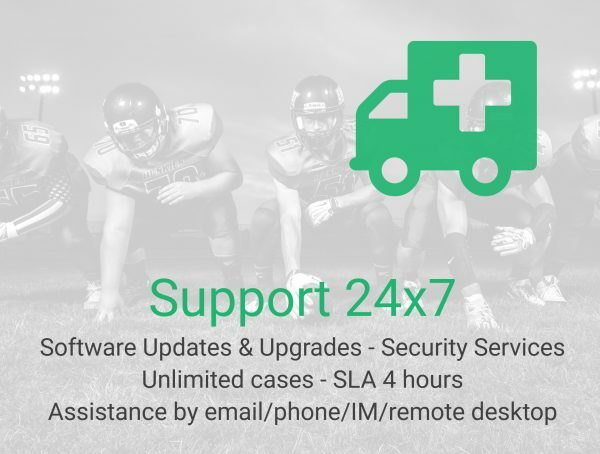 The 24×7 Support Plan is recommended for those who require updates, upgrades, complete cybersecurity services and assistance from the Zevenet heroes in real time with a yearly per node renewable plan. Updates and upgrades through a remote repository. Security Analyzer included. Unlimited cases available per node for this support plan. Zevenet engineers will be available to analyze your cases. Remote desktop or email access available to analyze your issues. Instant messaging or real-time assistance with an engineer available. Security services will be available to protect your applications. All ZEVENET products are supported in any platform available (Virtual, Bare Metal, Hardware, Cloud and Microservices) for any current and upcoming Enterprise Edition releases. What I’m going to get? This support plan includes software updates and product upgrades, hotfixes, quick protection for security flaws and direct assistance from our engineers. Cybersecurity services and Security Analyzer are available to detect security threats, fix weak configurations and protect completely your applications against attacks. Real-time assistance available. Unlimited cases available.